The Monaro Highway at Michelago was closed for around 10 hours after 3 people were killed in a head-on collision last night. Photo: Monaro Police District. Seven people have died in the last forty-eight hours on NSW roads in five separate accidents, prompting senior police to issue a warning as the school holidays come to an end. Locally, three people were killed last night (July 18) on the Monaro Highway at Michelago, 40km south of Queanbeyan. Just before 11.30 pm, emergency services were called to the head-on collision involving two cars believed to be a Citroen sedan and Ford Falcon sedan. As a result of the crash, one of the vehicles caught fire, with a boy, reported to be 11 years-old escaping the flames. The driver and passenger of that vehicle died at the scene along with the driver of the second vehicle. The child was taken by paramedics to Canberra Hospital, where this afternoon police say he is in a satisfactory condition. 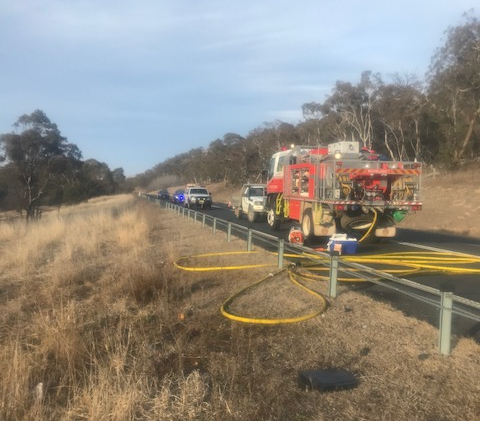 The highway was closed for around 10 hours while officers from Monaro Police District investigated the circumstances surrounding the crash. NSW Assistant Commissioner Michael Corboy, from the Traffic and Highway Patrol Command, says it’s believed one of the vehicles crossed onto the wrong side of the road. Seven people have died in forty-eight hours after five crashes on NSW roads, prompting senior police to issue a warning to all drivers to take responsibility on our roads as school holidays come to an end.Over the past forty-eight hours (Tuesday 17 July 2018 – Thursday 19 July 2018), seven people lost their lives in five separate crashes across the state.About 8.05am (Wednesday 18 July 2018), a 74-year-old man died after his Jaguar sedan left the roadway whilst travelling south on the Hume Highway at Pheasants Nest.About 11am (Wednesday 18 July 2018), a 30-year-old man died after his Mitsubishi Lancer collided with a Range Rover Evoque on Wilfred Barrett Drive at Norah Head, on the Central Coast.An 89-year-old woman died in hospital yesterday (Wednesday 18 July 2018), after her Toyota Yaris reversed from the driveway of a home on Terrace Place at Sylvania and hit a neighbouring fence on Tuesday (17 July 2018).Just before 11.30pm (Wednesday 18 July 2018), three people died after two cars collided on the Monaro Highway at Michelago, 40km south of Queanbeyan.Additionally, police are at the scene of a fatal crash on the Mitchell Highway at Wellington, that occurred just before 9.30am this morning (Thursday 19 July 2018).Investigations into the crashes are continuing.Assistant Commissioner Michael Corboy, of the Traffic & Highway Patrol Command, said the loss of seven lives in forty-eight hours must serve as a reminder for people to take personal responsibility for their actions.“To lose seven lives in the course of two days on our roads is nothing short of a tragedy, Assistant Commissioner Michael Corboy said.“Seven more lives lost means that we have now lost 199 lives on our roads in 198 days this year.“With the school holidays coming to an end and more people on our roads, drivers need to pay attention to ensure they arrive at their destination safety.“Our message is quite clear, all drivers, passengers, riders, cyclists, & pedestrians, should be aware of the risks not take their road use for granted, " Assistant Commissioner Michael Corboy said. “With the school holidays coming to an end and more people on our roads, drivers need to pay attention to ensure they arrive at their destination safely. “As is normal during school holidays we will be ever present on our roads, you will see us everywhere especially now coming into Friday, Saturday, Sunday, ” he says. Traffic moving in and out of the NSW snowfields along the Monaro Highway will be a particular focus. “Seven more lives lost means that we have now lost 199 lives on our (NSW) roads in 198 days this year, “Assistant Commissioner Michael Corboy says. The message from police is clear; do not speed, take regular rest breaks, be conscious of what is happening on the road around you, watch for animals on or near the road, do not use mobile phones while driving. I counted around 50 Kangaroo road kill between Tuggeranong and Michelago. Very large numbers of animals there on he move at night. Dangerous at dawn and dusk particularly.